"A Tree Grows in Lawndale" was the third episode of the fourth season of the Daria TV series (episode number 403). It first aired on MTV on March 10, 2000. This episode was written by Peter Elwell. Kevin's absence from the team begins to make its presence felt, as the Lawndale Lions enter a major losing streak (through no fault of Mack, who tries his best but just isn't quarterback material). In response, the rest of the town reacts in strange ways, such as the Fashion Club being shunned at Cashman's for coming from a "loser school", the Lawndale Shopper claiming property values are dropping like a rock, and Artie of all people taunting Lawndale High students as losers. This leads to desperate measures all around, from Ms. Li bringing in a psychotic thug as a 'ringer' quarterback, to Quinn and Jake contemplating moving to another town entirely. Helen is openly telling everyone to calm down and be sensible, but Daria spots her "trying to smudge her return address labels". When Daria and Jane try to think of a way to rectify the situation, Tom suggests that Kevin could regain his self-esteem by becoming a safety speaker at elementary schools, lecturing kids on the dangers of riding motorcycles and how to avoid the mistake he made. The plan works a little too well, as Kevin becomes absorbed with being a safety lecturer and forgets all about the team, who are stuck being terrorised by the new guy. 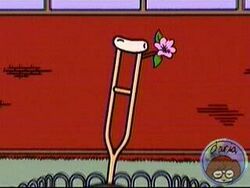 Brittany goes around collecting money to get a new Memorial Tree in the hopes Tommy's ghost will leave, and Daria tells her that she could plant one of Kevin's crutches as a new tree. (She doesn't realise this is a joke, to Jane's amusement) When she tries to get it, it leads to an argument where she tells Kevin he's abandoning the team and on his own; deciding "what's saving lives if there's no one to make out with? ", he casts his crutches aside and returns to the field (because his knee was fixed ages ago).
" "Safety's cool," says Kevin Thompson, the ex-quarterback who quit the Lawndale Lions after scraping his knee. The once-respected jock keeps busy these days spreading his message to grade school kids too young to grasp the principles of cowardliness and self-pity. Meanwhile the Lions continue their downward spiral as the one person who could save them spends his days encouraging kids to stay inside and fear their own"
The title of this episode is a play on the novel A Tree Grows in Brooklyn by Betty Smith. That last shot of the flower is a spoof of the last shot of the film version. The team aren't just losing without Kevin, they're being hammered: he's explicitly the only reason they win games. This both explains why he keeps getting byes (see "See Jane Run", "Mart of Darkness") from Principal Li and implies the other players are mediocre at best. This isn't implied in any other material and "The Daria Database" has Mack saying Kevin takes credit for what the other players do. Brittany is genuinely upset that she won't be dating Kevin. In contrast, in "Is It College Yet?" she's the one going to break up with him as he'll be getting held back a year while she moves on from school. We see a local elementary school, Lincoln Elementary. Behind Upchuck in the booth is a calender, marked Spring/Fall Schedule. "A QB Grows in Lawndale" by Kristen Bealer is an AU where Kevin decides that teaching the kids is more important to him than football. This page was last edited on 4 November 2014, at 18:07.